After 3 years as a happy Verizon Wireless customer, I was tempted away by Sprint's SERO deal (enter "savings@sprintemi.com" as the Sprint Employee Email Address): $30/month for 500 minutes, unlimited 7PM nights and weekends, unlimited text messages, and unlimited data on the phone. Both the service and the Q looked great on paper. Sprint's a CDMA EVDO network (which means great tower range and data speeds) that could roam onto Verizon when a Sprint tower wasn't around. And the Motorola Q is a full-keyboard smartphone with a great screen that was as slim as a RAZR and lighter than most regular phones for $79. 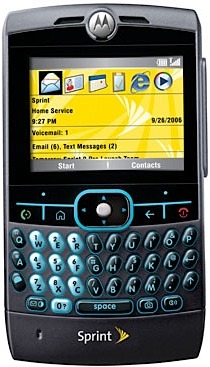 Last night, on day 29 of my 30-day trial, I cancelled Sprint's service and returned the Motorola Q that came with it. I should have listened to Jakob Lodwick, who warned me that Sprint was awful and getting worse. I pity anyone who ever needs to contact Sprint for anything. One representative told me that I could not add "phone-as-modem" support (laptop tethering) to any SERO plans. This was wrong, as confirmed by a different person who said that most employees just didn't know how to add it. My account was created without two of the major perks promised by SERO (7PM nights and unlimited text messages) without my knowledge. When I checked my account features on Sprint's (awful) website after a week of use, I noticed that both of these were missing and I had incurred text-messaging charges. I had to speak with awful customer service people (many in India) to add these features. In both cases, the first person told me that I didn't have those features and couldn't get them without paying, so I called back until I got someone who was willing to do it. My Motorola Q crashed frequently and would be inoperable for hours at a time, so I called to see if I could exchange it in a corporate Sprint store. "Yes." So I went to the store and waited in line for a half hour. "No, we can't do that. We can't find a record of you purchasing the phone." I had purchased it by calling Sprint and ordering it, and the Sprint store had no record of this, despite having my receipt, first bill, and account information. I later discovered that both were wrong. If you order your phone by phone or online, you can only return or exchange it by mail. If your phone breaks, even if you have the $7/month insurance, the only way you can get a new phone is to wait for them to mail you a box, repair or replace your phone somewhere far away, and mail it back to you. Verizon's customer support, on the other hand, is excellent. They've made a billing error here or there, but they were resolved quickly, politely, and properly. After 3 years, I have no complaints. And if an insured Verizon phone breaks, you can walk into any Verizon store anywhere in the country and get a replacement on the spot. I've been spoiled by 3 years with Verizon. Verizon's network is extremely fast and stable, with strong coverage and reception absolutely everywhere that I've ever been that had any cellular coverage at all. Sprint's network is what you'd expect if Verizon turned off two-thirds of their towers. Reception was weaker than Verizon almost everywhere, and calls occasionally suffered. The voice sound quality was excellent, though. This is the best thing I can say about Sprint's network, although it's more likely because of the phones. Data was great when it had strong reception, but this wasn't very often. On my train commute, where Verizon can hold a strong signal and stable pings, Sprint was spotty and speed varied wildly. While traveling outside the New York metro area, Sprint had weak, unstable reception in areas where I've always had very strong Verizon service. Data speeds and connection stability in 1X (non-EVDO) coverage areas were significantly worse than Verizon's 1X coverage in the same spots. Roaming onto Verizon's network wasn't incredibly useful because of the nature of roaming: phones will prefer any signal from their home network before they'll switch over to roaming, so even the weakest 1-bar Sprint signal will take precedence over a full-strength Verizon signal. The Motorola Q and Windows "Smartphones"
Physically, I couldn't ask for a better device. The Q has a full QWERTY keyboard and a beautiful screen. It's thinner and lighter than most regular phones and almost every smartphone. Calls are loud and clear, and the speakerphone is strong. It runs Microsoft's Windows Mobile Smartphone Edition, which is made for PDA-like phones without touchscreens. In practice, I found that the lack of a touchscreen didn't matter, and I didn't miss it. Synchronization with OS X was easy and very good with The Missing Sync ($40). But battery life was extremely poor, and most users will need the extended battery, which adds significant weight and thickness and therefore removes much of the appeal of the Q over other smartphones. Like many Motorola and Microsoft products, the hardware and software were extremely buggy. It crashed and rebooted itself frequently (probably a defective Q), but even when it was working, the Windows Mobile OS was just painful. In traditional Microsoft fashion, the interface was half-assed. Great functionality is hidden behind awkward interfaces, bad formatting, and flawed workflows. At every turn, I kept asking myself, "Has anyone at Microsoft actually used this?" It's a great device paired with awful service for $600. So for now, it's not of much use to most people, including me. But I bet I'll be using an Apple phone in 5 years. Smartphones offer nice capabilities, but the Windows Mobile Smartphone Edition is mediocre at best. And the Motorola Q, while great physically, is not stable or usable enough to recommend. At SERO pricing, Sprint's network is somewhat attractive for the extremely budget-sensitive. At the regular prices, or for anyone who cares about coverage, data, and customer service, there's no reason to go with Sprint over Verizon.